In 2015 has been produced sailing boat Hanse 415 called H 415-2. This sailboat is placed in base Göteborg in the surrounding area of Göteborg in Sweden. 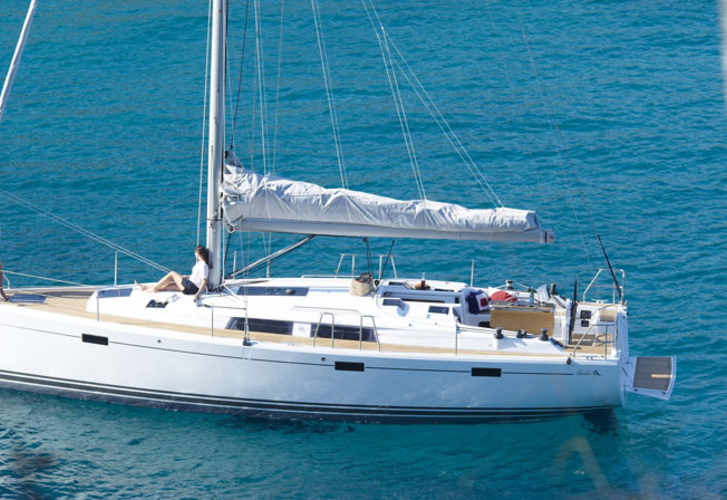 You can board up to 7 pax on the sailing boat H 415-2. Configuration of sleeping places is 7 (6+1). There are 3 bedrooms placed under yacht's deck. H 415-2 is equipped with 2 WCs. Look for more search results over here: Yacht charter Göteborg. Tank for fuel is 160.00 l l. big , water tank has up to 520.00 l l. In this sailboat is applied motor 38 HP. With 12.00 m of lenght and 4.17 m of beam H 415-2 offers enough space for comfortable sailing. Hanse 415 H 415-2 is equipped with: Autopilot, Plotter gps in cockpit, Anchor electric windlass, Mainsail with lazy jack, Heating. . Nonrefundable caution is 2000.00 EUR. Find more offers under this link: Yacht charter Göteborg.